My grand kids stay overnight every Wednesday. In the morning, we have to decide if they are doing a hot school lunch, or a cold sack lunch packed by NeeNee (that would be me). My four year old grandson, Fischer, is in love with superheroes (imagine that!). His favorite is Spiderman. Here is this week’s cold lunch bag. I purchased the black plastic spiders from GoPlanetEarth.com. 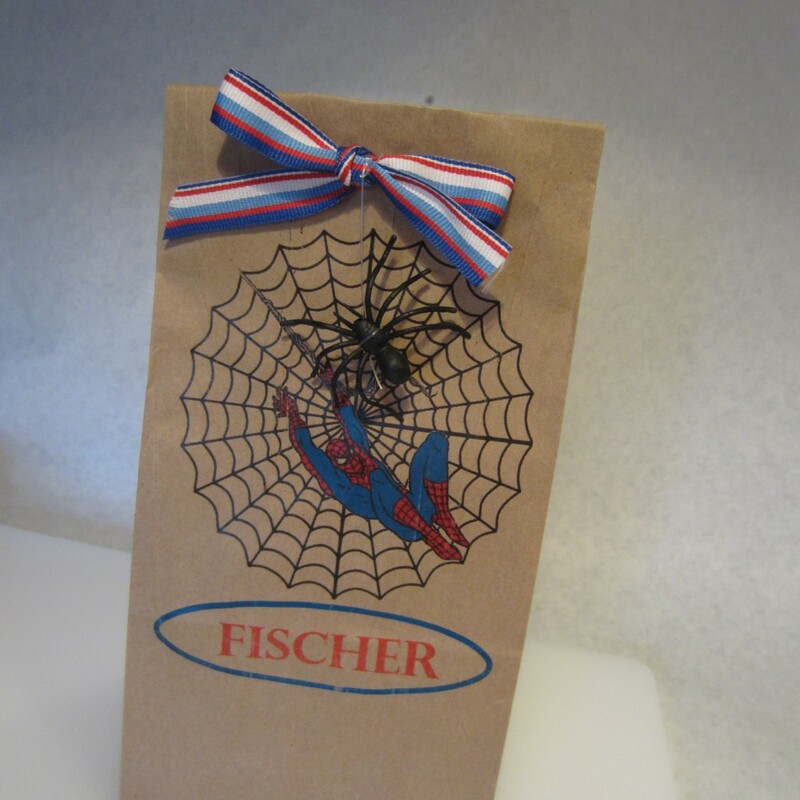 The spider is attached to the ribbon with transparent fishing line and artwork was printed onto the lunch bag with a color laser printer. If you order only the spiders from GoPlanetEarth, mention the following in the comment section at checkout: SPIDERS from Blimpy Girl web site. The company will remove the displayed shipping cost and charge only $2.00 for shipping in a padded envelope. That’s comes out to 29 cents per spider (with shipping). You have the option for repeated use if you instruct your child to bring the spider home. Email me for a FREE MS Publisher template allowing you to swap out the child’s name. Untie the ribbon to open the lunch bag and use the spider to frighten lunchroom friends. Fold over the top of bag (about one inch) and punch two holes for threading the ribbon. 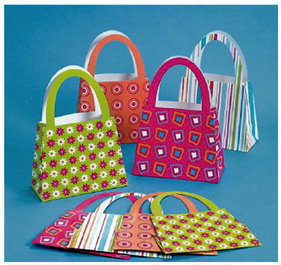 This is also an economical way to make birthday treat or goodie bags. I finished planning and gathering supplies for my grandson’s upcoming Camouflage Birthday theme. It’s now time to focus on my granddaughter’s birthday. May will be a busy month with two birthday parties a week apart. 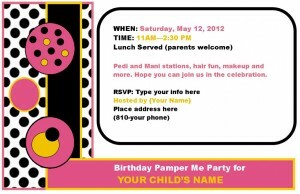 As a school principal with three kids, my daughter has little time for party planning, so I offered to help. 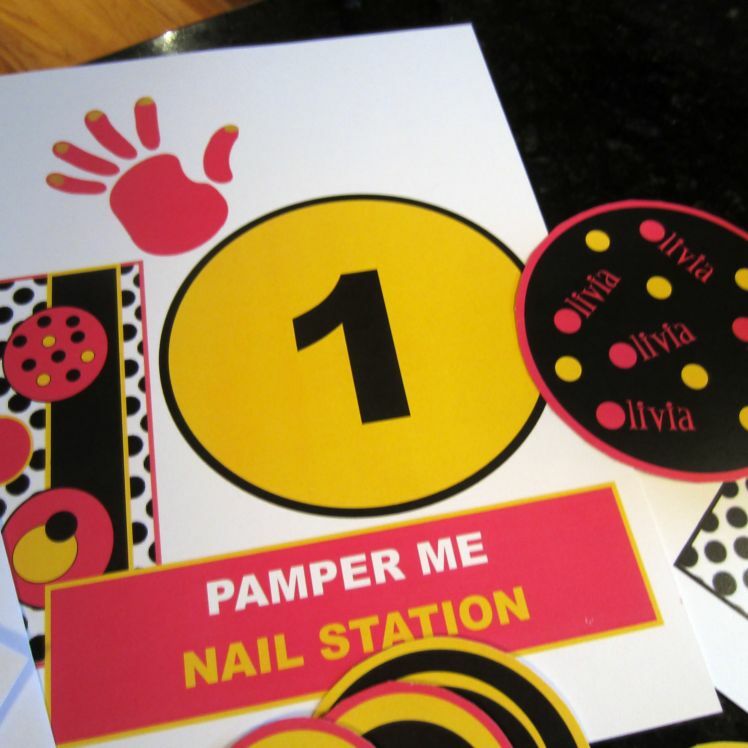 My granddaughter’s name starts with an “O” (Olivia). A polka-dot theme seemed an ideal choice. Olivia’s only request was that pink was included in the party colors. Yellow, pink, black and white are the themed colors of choice. 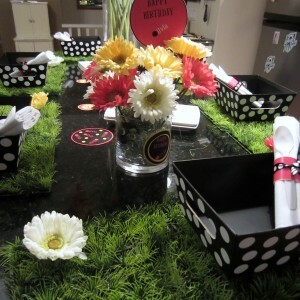 The invitation (shown left) include a black and white polka dot bow in the upper right corner. I printed 6 x 9 envelopes with the same design but arranged the objects to allow for postal mailing. I did a quick run through on the table setting placements. I know it sounds crazy, but I leave for vaction next week and have little time to get my dots in row (yes, pun intended). The final table setting will include linen tablecloths (light pink with a black overlay), polka dot balloons attached to each lunch box and glass stemware tied with a ribbon. Pink lemonade with a lime wedge is the party beverage. I found the grass mats online. The cost was minimal and I can reuse them for other party events. The menu is simple. PBJ sandwiches from Costco, pink yogurt and fruit kabobs. No cake or cupcakes, just mini cinnimon rolls with a candle in each one. This was Olivia’s request. Besides, kids tend to eat only the frosting and the rest goes to waste. 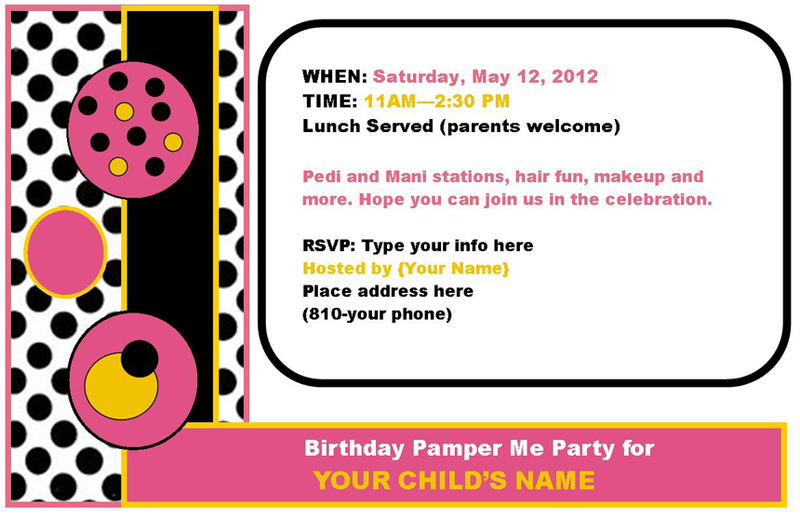 This is a “Pamper Me” party. There are four girls and one adult to work each Pamper Station. There are Mani, Pedi, Hair and Make-up stations. The hair station includes French braiding along with extension feather clips. Of course, Justin Bieber will be the background music. Yippee, I can’t wait (NOT!). The sacrifices we make for our grand kids. Total cost of each goodie bag (I only need four) is $17.50 each. Plus, they can use some of these items at the party. Contents were purchased from Oriental Trading and Forever 21. The Tinkerbell mineral make-up stamp was from an online party store. It was the most expensive item at $3 each but can be reused multiple times. The final party touch are white chair covers. I didn’t count them in the party costs since they can be used when hosting my personal events. Black, white and pink tulle dress the back of each chair along with a large black silk gerbera flower. I will take plenty of photos once the table and party decorations are officially in place. 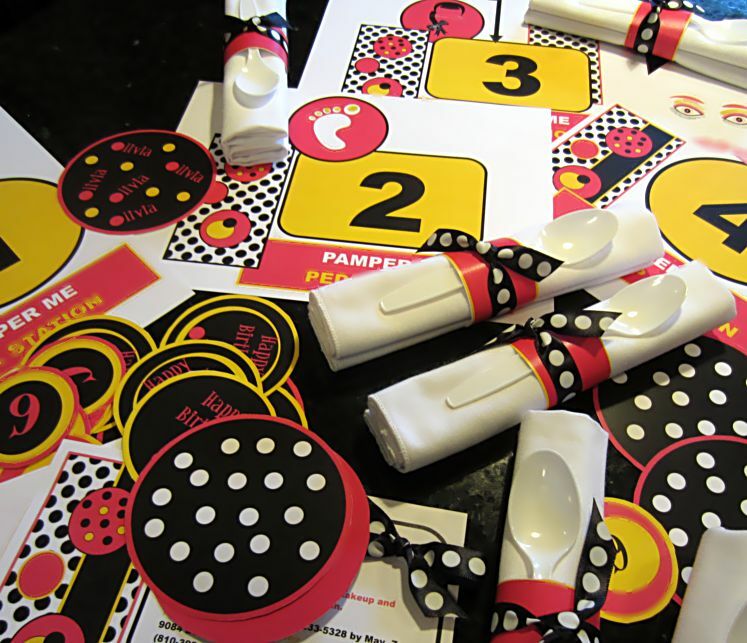 Look for printable templates so you can create your own polka-dot party. 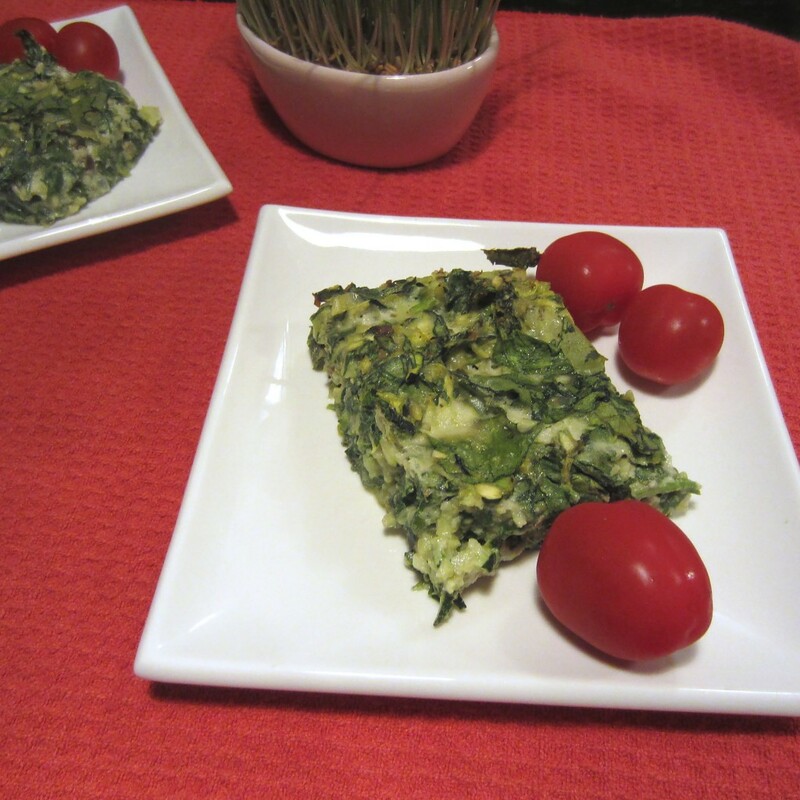 This is a different take on the Zucchini-Apple Crostini that I posted about back in March 2012. Cut two medium size zucchini into 1/4 inch slices (nip the ends first). Chopped a small onion and add both to a skillet sprayed with non-stick cooking spray. Cooke until soften and the zucchini has a toasty brown areas. While this is cooking shred 1/2 of an apple (cored, but no need to peel skin). Add this to the zucchini/onion mixture, tossing gently. There is no need to cook the apples as they will bake in the oven. Season with salt and pepper to taste. Remove skillet from heat and scoop out enough mixture to fill individual ceramic baking cups. I was able to fill 5 cups. Set the cups on a cookie sheet. Sprinkle with freshly grated Parmesan reggiano cheese. 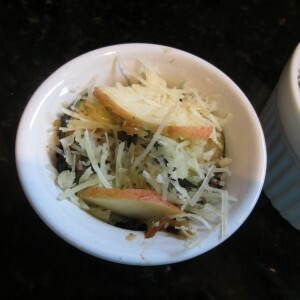 I added a couple of sliced apples to the top of mixture before sprinkling cheese. Bake in oven for 10-12 minutes (until cheese has melted over the top). Remove from oven and serve hot. Calories are minimal, in the neighborhood of 68 calories per serving. If you omit the cheese, you can save yourself 20 calories. In my opinion, go for the gusto. Pair this with a pan seared chicken breast or small beef tenderloin steak and you are still under 300 calories. 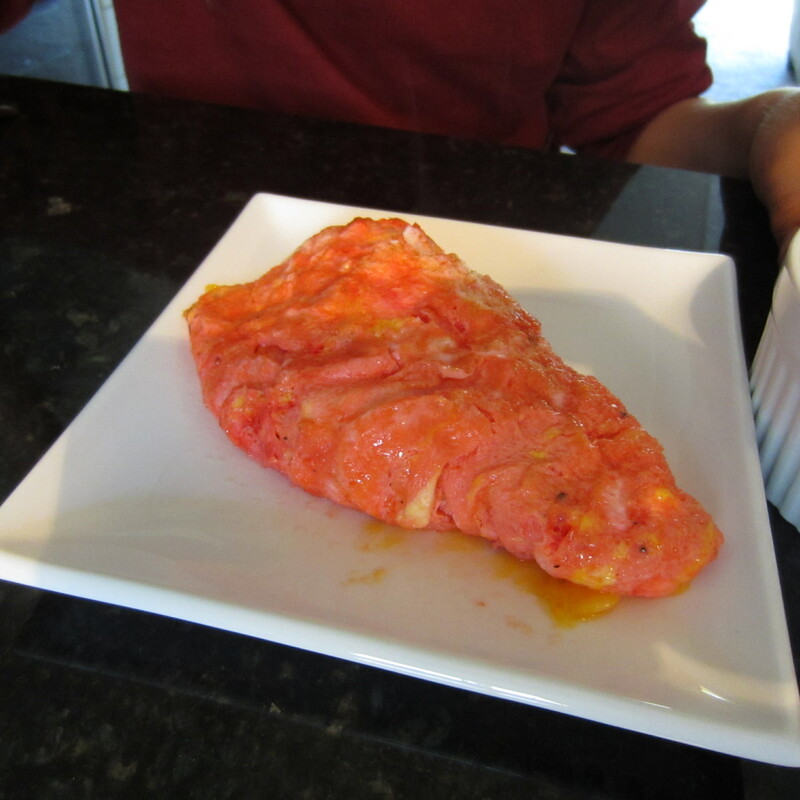 Now here’s a new take on scrambled eggs…brain eggs. This morning my honey-man (the wine guy) made this egg scramble for our 9 year old grand son, Carson. When ketchup was squirted on the eggs, it looked like brains Ala mode (go figure, he’s a boy and that kind of stuff excites him). 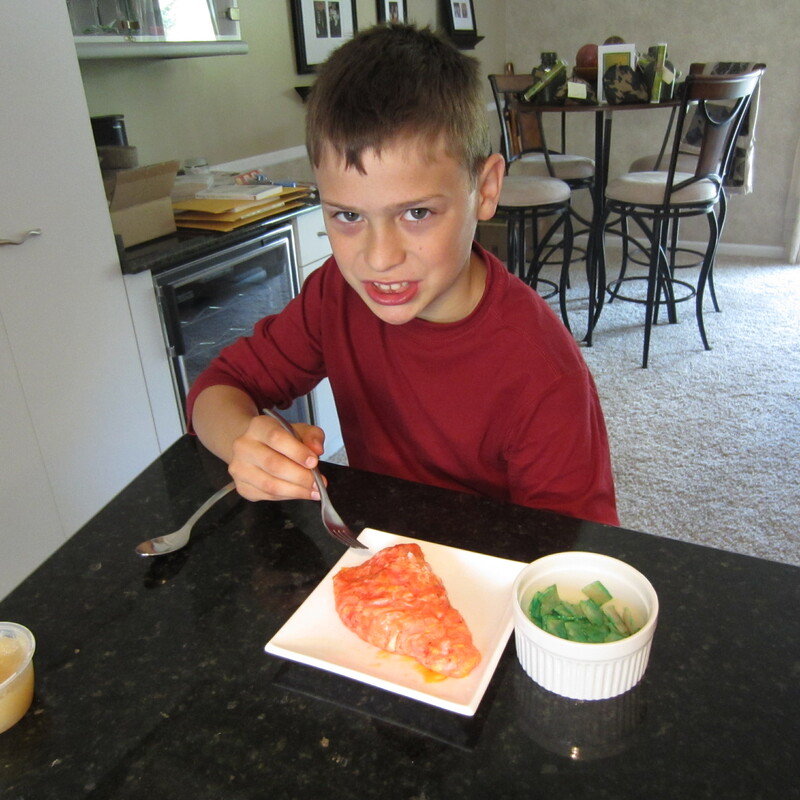 Nothing complements a brain egg dish better than green ham. I am certain there is a story line in here somewhere. I just have to figure it out. Kids love when you are creative with food or any other activity. They will dive in wholeheartedly if you make it fun. It was an unexpected Sunday morning with the grand kids. It’s what the wine-guy and I live for… the little peeps remind us life is good. Poppy (the wine-guy) and I had the grand kids on Friday night. Poppy prepared filet mignon steak for the them along with mac n’ cheese, spinach salad and leftover pizza. It was quite a combination of flavors. 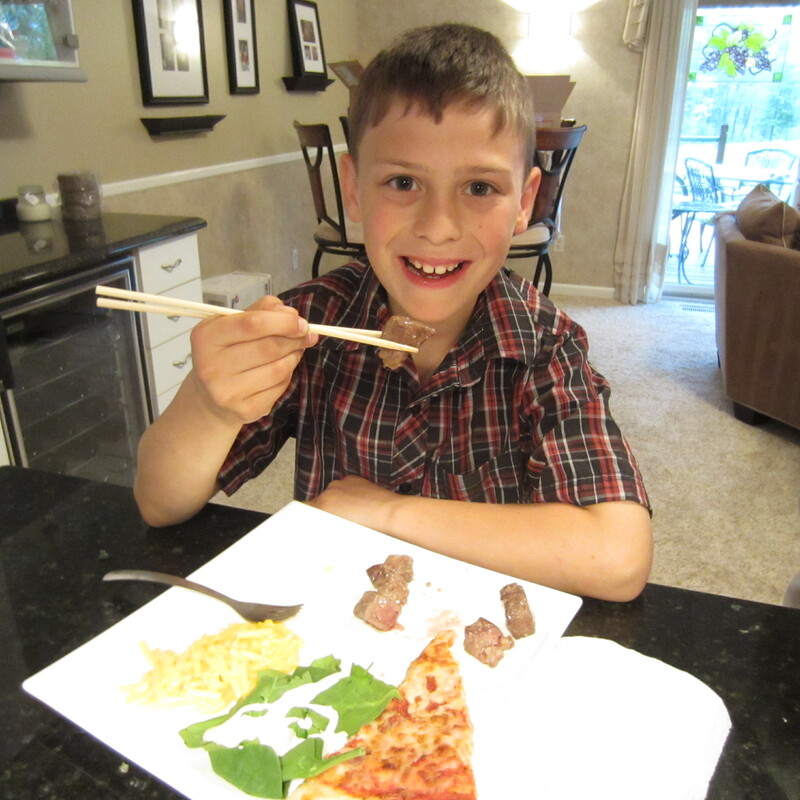 My nine year old grandson, Carson (pictured above) has been intrigued with chopsticks ever since he watched Poppy use them at dinner one night. He is working hard to become skilled in their proper use, something Blimpy Girl has failed at miserably. Five year old Olivia (soon to be six) used more of a jab and stab technique. It’s very similar to the way Blimpy Girl NeeNee uses chopsticks. On a recent trip to Argentina, we went with a large group to a sushi bar. I was the only one that requested a fork. Yes, it was embarrassing but dropping sushi all over my lap while trying to manipulate chopsticks would have been worse. 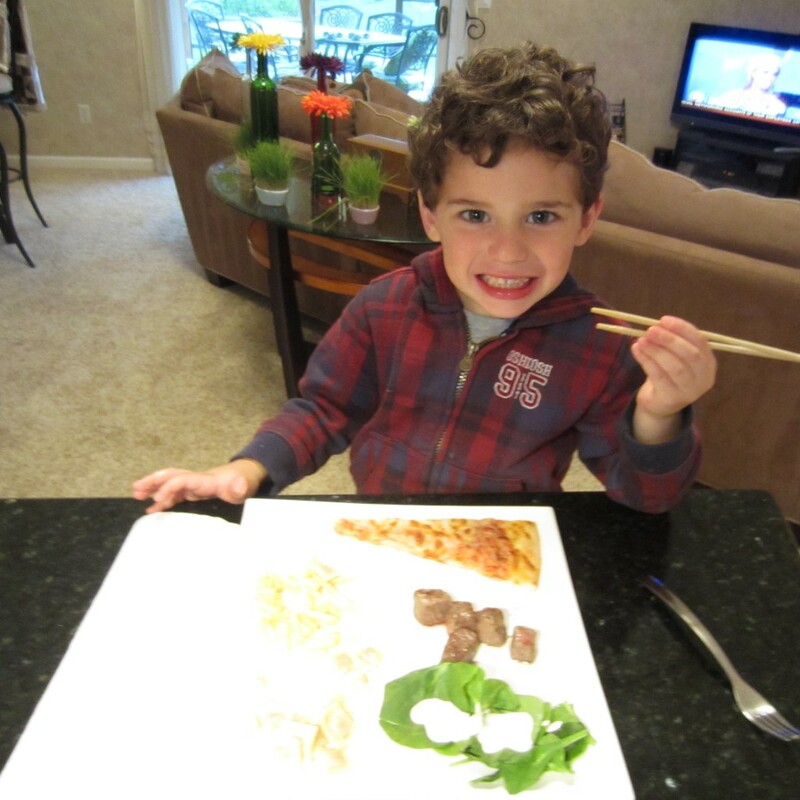 Our youngest grand child, Fischer, handled the chopsticks fairly well, considering he is only three (soon to be four). If his brother and sister are doing it, then count him in on the action. 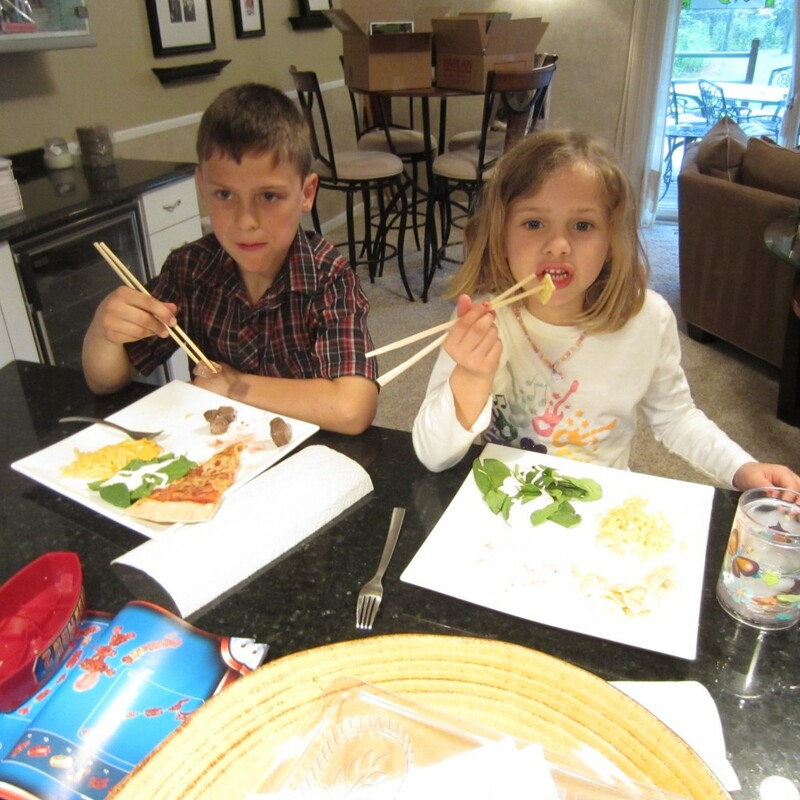 When the kids started to use the chopsticks to eat their pizza, Poppy quickly reminded them that pizza is “finger” food. It was a fun meal. The kids learned something new and we discussed different cultures. Our sister-in-law, Mariko, is Japanese and we try to incorporate her heritage and culture into our family gatherings. I posted her Gyoza recipe a while back. 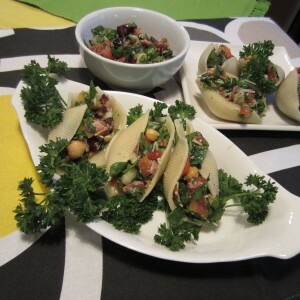 A colorful and easy appetizer you can throw together in 20 minutes. Serves 24 and you can swap out ingredients as needed. 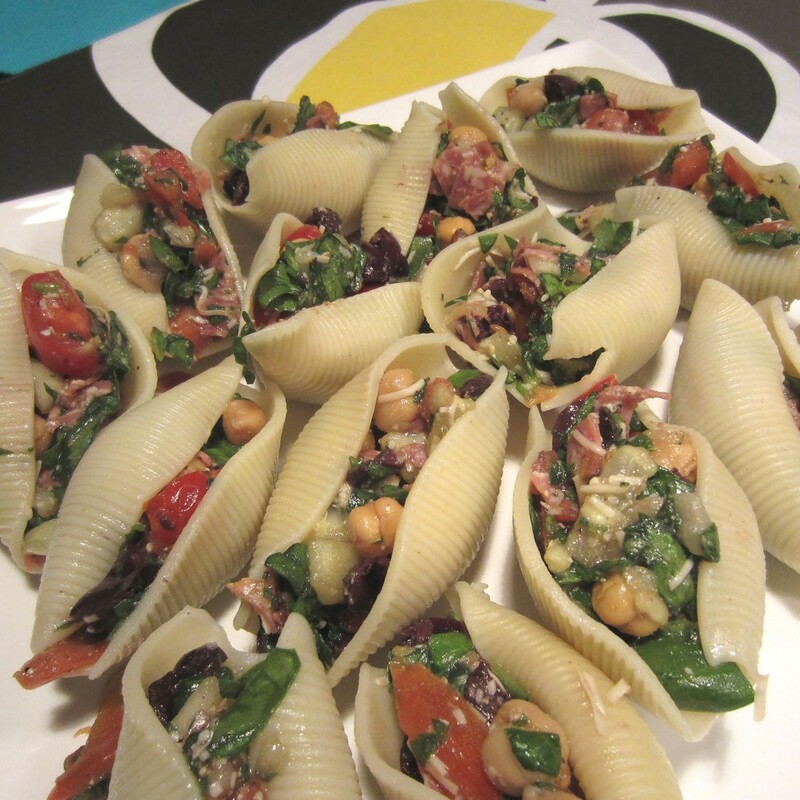 Each jumbo shell is a mere 65 calories. Tasty and filling. 6 round slices of salami, chopped. Look for fat-free brands. Cook shells as directed on package. You will want them al dente. Once cooked, rinse in cold water and drain. Combine all the cut and chopped veggies in a large mixing bowl. Add olives, cheese, salami, and chick peas. Pour Caesar dressing into bowl and gently toss. Stuff each shell and serve. Best served fresh. Serves 24 and in the neighborhood of 65 calories per shell. This vegetable dish is packed with plenty of garlicky taste. Bring along breath mints if having this for lunch or dinner. Of course, you can omit the garlic, if you like, but garlic is good for your health. Studies have shown that it relaxes the blood vessels and increases blood flow. As usual, I’m always on the look-out for food that is reaching its life expectancy. 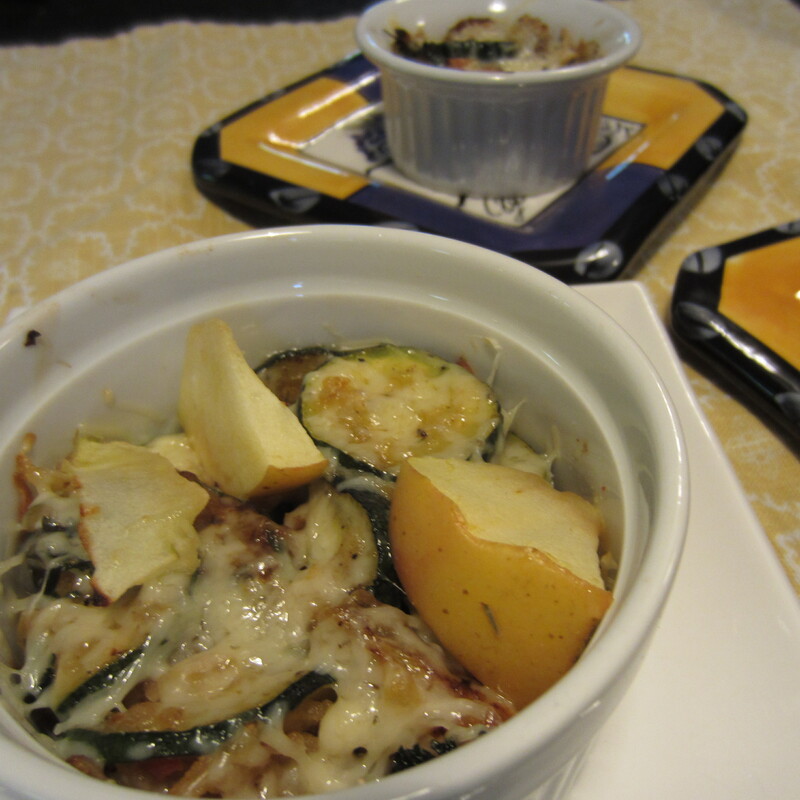 My zucchini was nearing death so I resurrected it into a baked au gratin dish. I haven’t tallied the calories yet, but I will do that soon. The bake will easily serve 8 people as a side dish. Pair with pan-seared boneless chicken breasts. I wanted to use some turkey bacon in the dish, but discovered I had none. I used bacon bits instead which kept the calories in check. If weight is not an issue for you, go for the gusto! Use real bacon (about 3 slices, cooked and chopped). 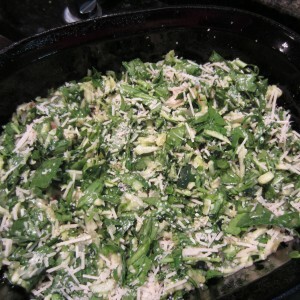 Place shredded zucchini in a colander. Sprinkle with a teaspoon or so of kosher salt. Place colander in sink and let set for 20 minutes. The salt will extract excess moisture from the zucchini. Pat zucchini dry and transfer to a mixing bowl. Add chopped spinach, parsley, 1/2 cup grated Parmesan cheese and garlic to the mixing bowl. Set aside. If using bacon slices, add to skillet and cook until crispy. Add chopped onion and cook until tender. If using bacon bits, add olive oil to skillet and cook onion. 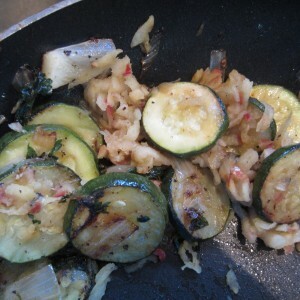 Add onion and bacon to the zucchini mixture. Add eggs and mix well. Salt and pepper to taste. Transfer mixture into a baking dish that has been sprayed with non-stick cooking oil. 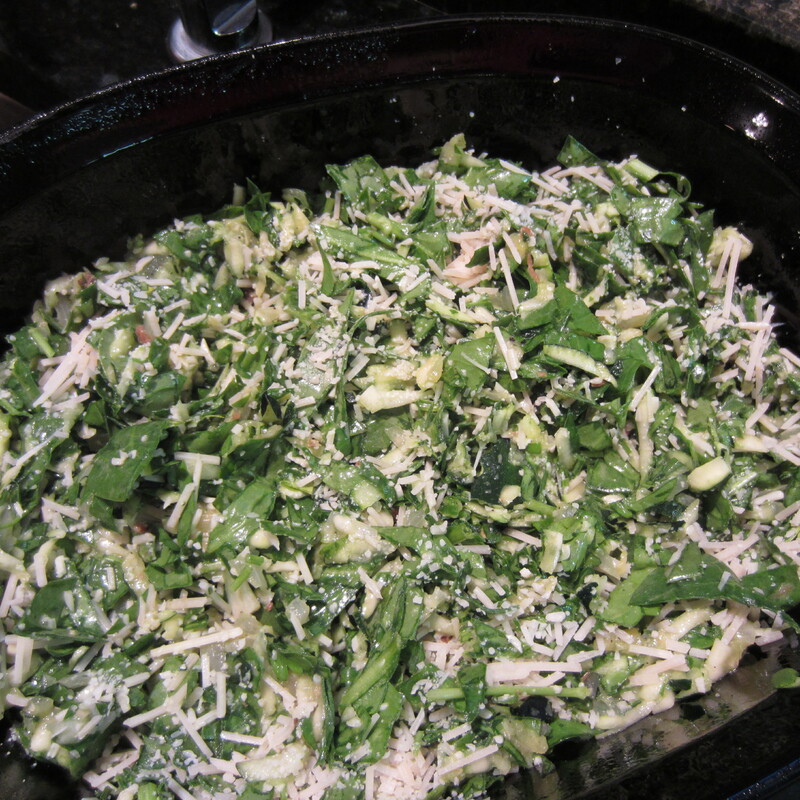 Sprinkle the 1/3 cup grated Parmesan-Romano cheese over the top. Bake in 350 degree (F) oven for 35-40 minutes. Refrigerate if dish is not served immediately. If allow to cool completely, you can cut into squares and reheat in microwave. If served hot from the oven, the mixture will need to be spooned onto serving plates. 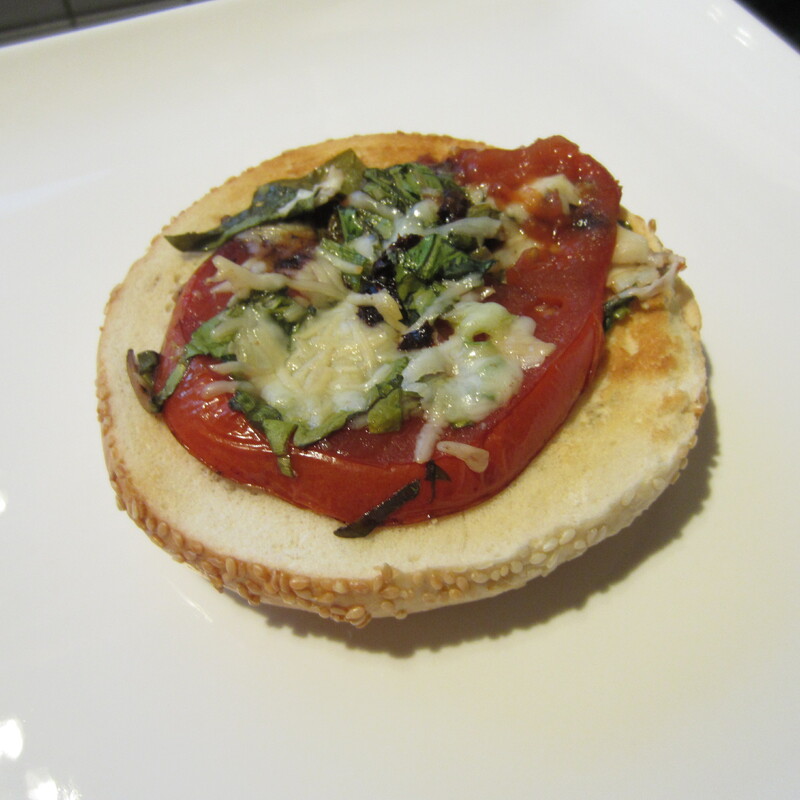 Open face tomato-spinach-cheese sandwiches in just 10 minutes. 140 calories. Add a salad and you’re still under 200 calories! My daughter, son-in-law and kids stopped by after Upwards soccer practice last night. Everyone was starving. Pressed for time, I gave the kids crustless PBJ sandwiches (thank you Costco for these individually wrapped sandwiches!). It was open face tomato-spinach sandwiches for the big people. I used leftover bagels from our Easter brunch. Based on comments, I believe they were a hit. My daughter stopped by this morning for a second helping for her work lunch. Tomatoes and toppings were baked in the oven and bagels toasted. Using a spatula, place the tomato topping atop the bagel. A vidalia onion slice with the tomato goodness is another great addition to this sandwich. Prep time for this dish is 10 minutes. Bake time is 7 minutes. Fresh spinach, tomatoes and cheese are staple ingredients in Blimpy Girl’s kitchen. My focus centered on a couple of tomatoes clinging to life on the windowsill. They rose to the occasion and, under the knife, their life ended with purpose. 1/3 cup sun-dried tomatoes, chopped (reduce calories by avoiding those soaked in olive oil). I use the dried version in a bag. 1 roasted red or yellow pepper. 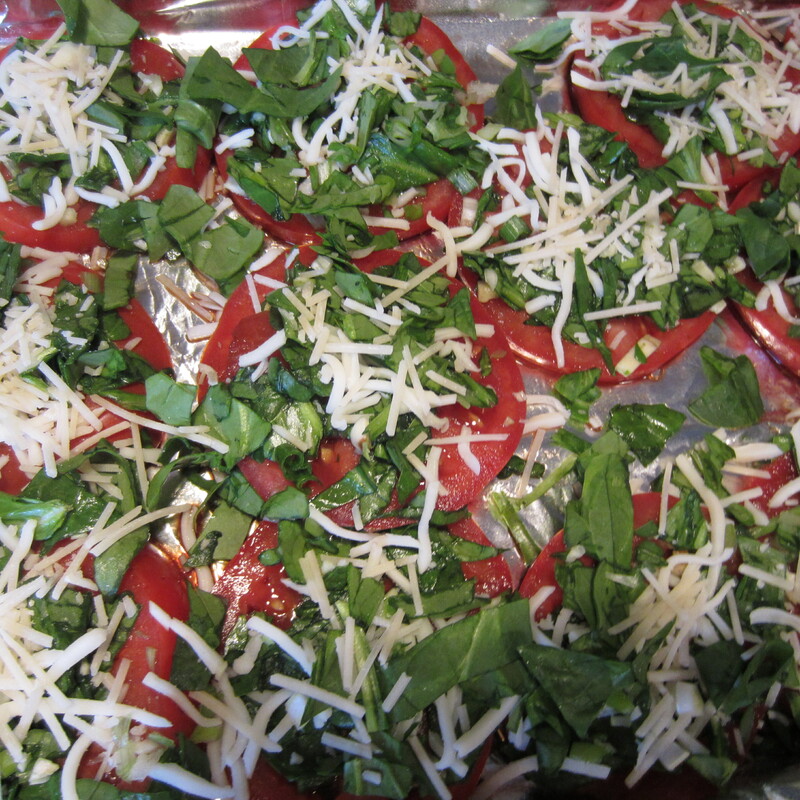 I keep roasted peppers on hand, if not available or pinched for time, dice the bell pepper and add to the spinach mixture. Line a cookie sheet with aluminum foil. 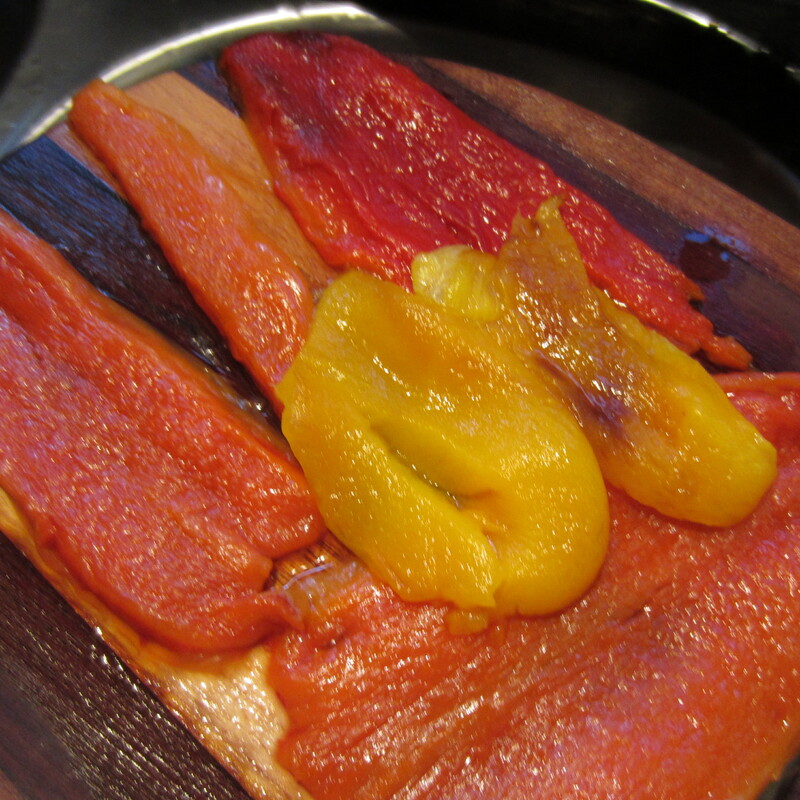 Dip tomato slices into balsamic vinegar. Or, drizzle vinegar onto the tomatoes. 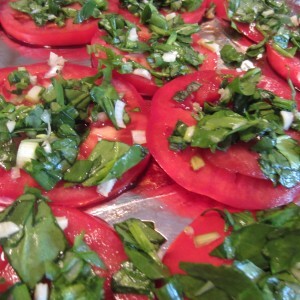 Place a single layer of coated tomatoes on cookie sheet. Set aside. 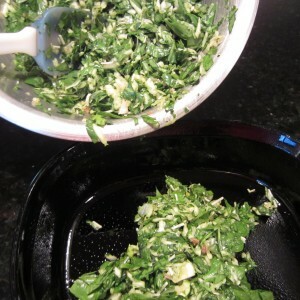 In a medium bowl, add chopped spinach, garlic salt/pepper and lemon juice. Toss until mixed. 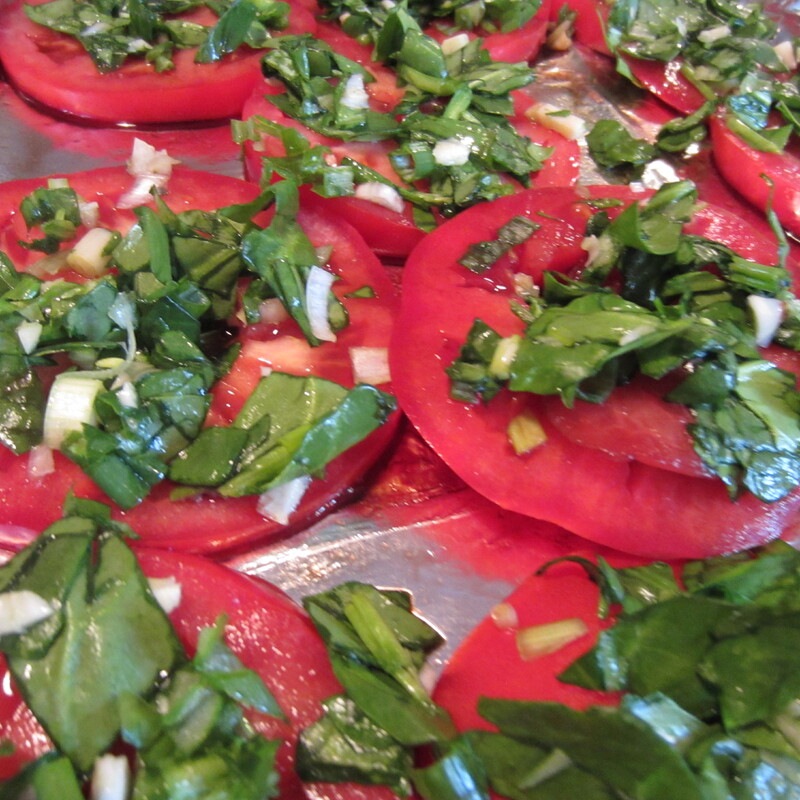 Place spinach mixture on top of each tomato slice. 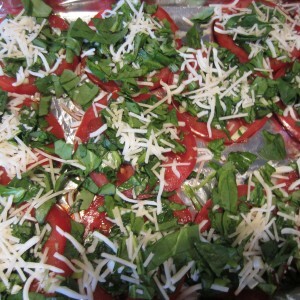 Add a slice of roasted bell pepper and top with cheese. 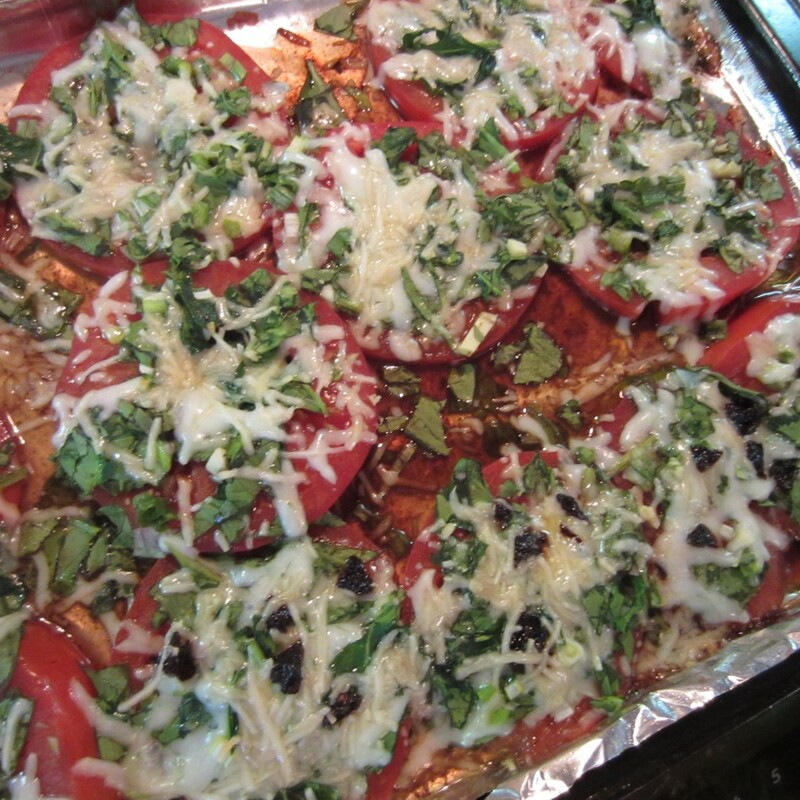 Bake the tomatoes for 7 minutes in a 350 degree oven (or until cheese melts). While tomatoes are cooking, toast the bagel halves. Remove tomatoes from oven and allow to cool for 5 minutes. Add the onion slice to bagel (if desired) and tops with a baked tomato slice (depending on diameter of bagel, you may want two). Standard bagels are in the neighborhood of 230 calories (unless using a low cal brand). With all the other ingredients (if using low-fat cheese) you’re at 300 calories for two halves. Reduce the calories even more by using low-fat muffins instead of bagels. I am looking forward to our family Easter celebration today. My grand kids are back in Michigan after a week’s stay at their NeNa and Poppa’s house. The table is set for our twenty guests and includes the above Jelly Bean Prayer centerpiece. I happened upon the poem while surfing the net and thought it clever. I’m not sure of the author, otherwise I would give credit where credit is due. I printed out each poem line and secured the front and back sides with double sided tape (my favorite tape, as you know). Printing on both sides allows guests to read the poem from any table seat. Wooden skewers (cut in half) seat the poem line into the wheat grass egg cups. 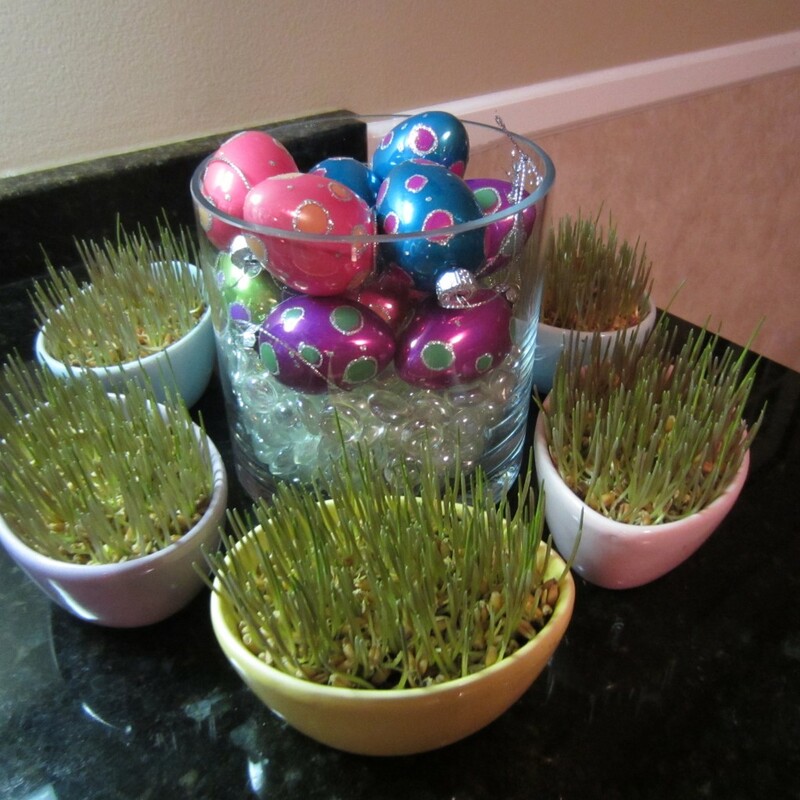 Yep, that same wheat grass I’ve been yapping about in prior posts. A bag full of Jelly Beans colorful and sweet is a prayer, a promise, is a child’s treat. Pink is for our new tomorrow. 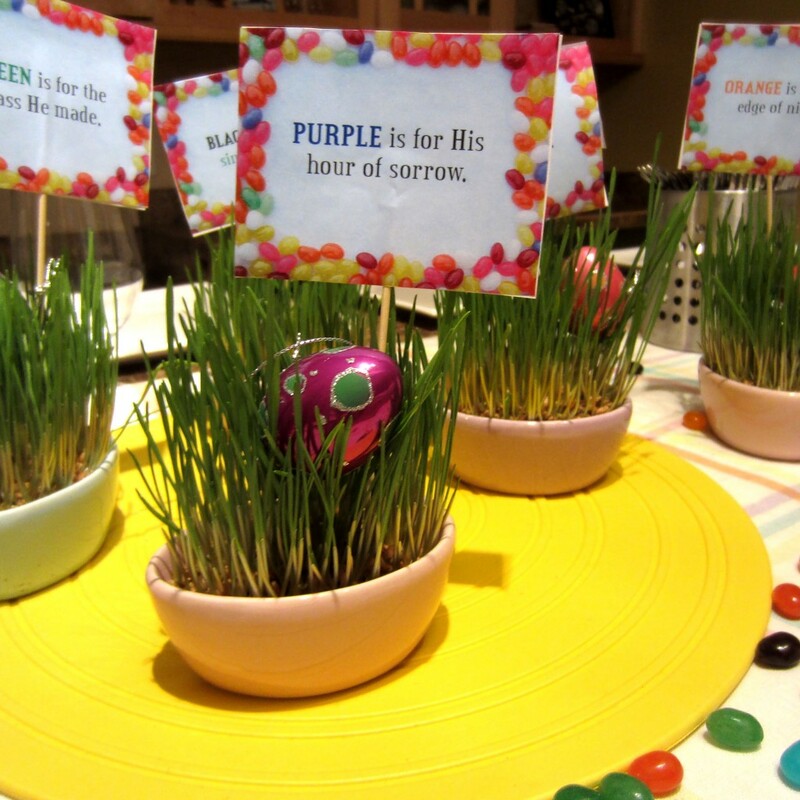 Jelly beans are sprinkled around each egg cup. This poem will be our Easter dinner blessing. After dinner, we will have a traditional egg hunt for the kids.Thankfully, the weather has agreed to cooperate. Sack races, canvas painting/decorating and prizes are all part of the celebration. For my family, it’s a day of rejoicing in our faith of the death, burial, and resurrection of Jesus. However you celebrate Easter, may it be a time of sharing the company of those you hold dear. 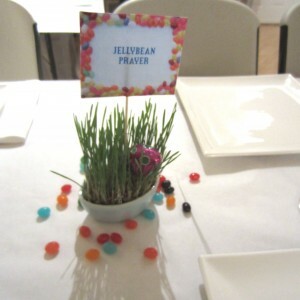 I’m starting to visualize my Easter table setting. Woo Hoo! Just hope it fills in more. But the fact that I grew this at all, is amazing. I’m not Martha, but I may be a runner up. 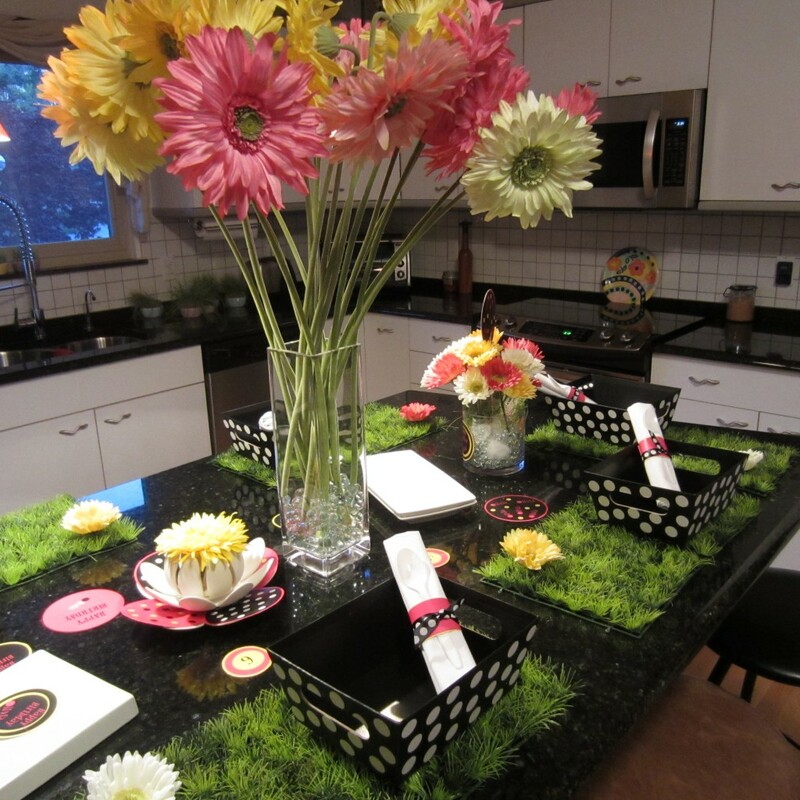 Can’t wait to show you all the final table setting…. and, of course, the soaps I’ll be making with the dried wheat grass. Enjoy your day.